Indicates current mode is Media (remote control) mode. Press the control keys (as shown on the right) to control the media software and playback contents, surf Internet, or manage presentations. EZ Input has a built-in code book which records control hot keys for most of the popular media software. It is stored in the file “EZInput.ini” in a text friendly format. Users may edit the file and attach a new key book for their favorite application. When users press control keys on the EZ Commander, EZ Input looks up the code book for the media software. If it is supported then it sends out its control hot keys. The string on the left of “=” is the name of control keys on EZ Commander. The string on the right of “=” is the control hotkey of Windows Media Player v.10. These are the keys sent out by EZ Input to the Windows Media Player when you press the media control keys on the EZ Commander. 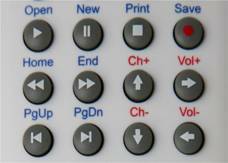 This is how EZ Input controls the media software to play back your contents.